These are so delicious and under 100 calories each!! 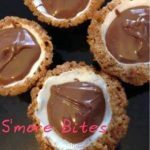 Great for serving at a party or keeping on hand for those chocolate cravings. Break 2 of the Hershey bars into individual pieces, set aside. Cut each of the marshmallows in half and place the cut side up (otherwise they'll stick to the plate). In a small bowl combine the melted butter, graham cracker crumbs and powdered sugar, mixing well. Spoon about a Tablespoon of mixture into each cup of a (24) mini muffin tin. Pack down tightly using the bottom of measuring cup. Press an indentation in the center of each cup. You must press them in deeply or they will crumble when you take them out. Place in oven for 4 minutes. Remove and immediately place a single square of chocolate in each cup. Then immediately top with marshmallow half, cut side down. Return to the oven and bake for about 4 minutes, or until marshmallows puff up a bit. Place the muffin tin on a cooling rack for about 15 minutes. Using a butter knife, gently loosen edges of the bites and lift them out onto plate. If they crumble let them cool a bit longer. Melt remaining chocolate in microwave safe bowl by breaking in pieces and cooking for about 25 seconds. Don't overheat as chocolate will separate. Stir. 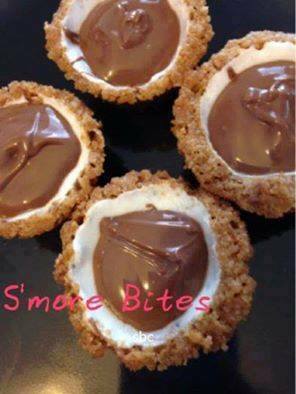 Drop a dollop of melted chocolate on top of each one. Enjoy!